Customer identity and management technology plays an important role with media and publishing companies as they optimize their paywalls to convert more subscribers. The media and publishing industry has been through the wringer in the last decade losing a whopping $31 billion of their total advertising revenue, and the forecast for the future is more of the same. But before you give up hope for the future of digital media, there may be a reason for optimism: people don't prefer ads and are willing to pay for ad-free content. Ad-blocking software is on the rise with 25% of internet users currently blocking ads. In fact, publishers are turning to CIAM (Customer Identity and Access Management) technology to help them deliver personalized ads to enhance the experience. According to a recent study by Media Insight Project, over 50% of adults already pay for some form of news or magazine content. Since the Wall Street Journal took a stand in the 1990's and implemented a hard paywall, consumers have shown that they can be willing to pay for written content. This willingness to pay has shifted the revenue model where acquiring new paying subscribers is more lucrative than relying on advertising revenues. But with so much free content just a click away, media and publishing companies must deliver a compelling customer experience to compete and attract new customers. A key driver in converting new subscribers is your paywall strategy. Paywalls, which were once used to keep non-paying users out, are evolving to entice new customers to pay. In this post, we’ll share how these paywall strategies work with CIAM technologies to help publishers attract new customers and drive revenue through three standard approaches: metered, freemium and hybrid. Metered paywalls give users access to a fixed amount of articles before they are forced to subscribe. This is the popular approach for brands with a larger, more established readership, such as NY Times and Financial Times. Metered access allows publishers to show their value and then upsell their readers to access more. If your company consistently delivers high-quality content, the metered paywall can be very effective. Over the past year, the NY Times has increased first quarter circulation revenues by 11% with digital-only subscription revenue growing at 40% year-over-year to $76 million. "Soft paywalls can hook potential customers." Metered paywalls are most effective when you can accurately track users to ensure they don't go beyond their article limit, while also leveraging their behavioral data to recommend additional articles that they would like to read in order to improve a conversion. CIAM technology gets the most out of your metered paywall by giving every visitor, even if they don't sign up, a unique ID that follows their activities and gathers relevant behavioral data. The anonymous data informs your marketing efforts to attract like-minded users, but, more importantly, you can personalize your paywall pages with relevant content based on the behavior of your anonymous user. When you customize your paywall messaging to speak directly to a user based on their interests, your conversion rates will skyrocket. The freemium model divides content into free and premium sections where users are able to access most of the site indefinitely, but there are special areas that are walled off and require paid access. Freemium gives publishers control over the content and services that are set aside for paying customers, which allows them to test prices, subscription offerings, and features to acquire new customers. ESPN has developed several premium products to upsell their free readership, including their Insider content series. As the trend towards paid subscriptions continues to grow, the freemium model has become a popular strategy for lesser-known content providers who need exposure before they can prove themselves as a subscription business. But for larger companies, like ESPN, there is still a benefit in collecting user data from their free users to develop more relevant products. "Freemium content is a great way to get known before trying to upsell." The freemium model gives publishers a few avenues to upsell premium products, but there is also an opportunity to generate user sign-ups. By asking users to sign up for limited access to premium content, to allow commenting on articles or to receive a newsletter, you can collect their registration data. But it needs to be super easy and painless. 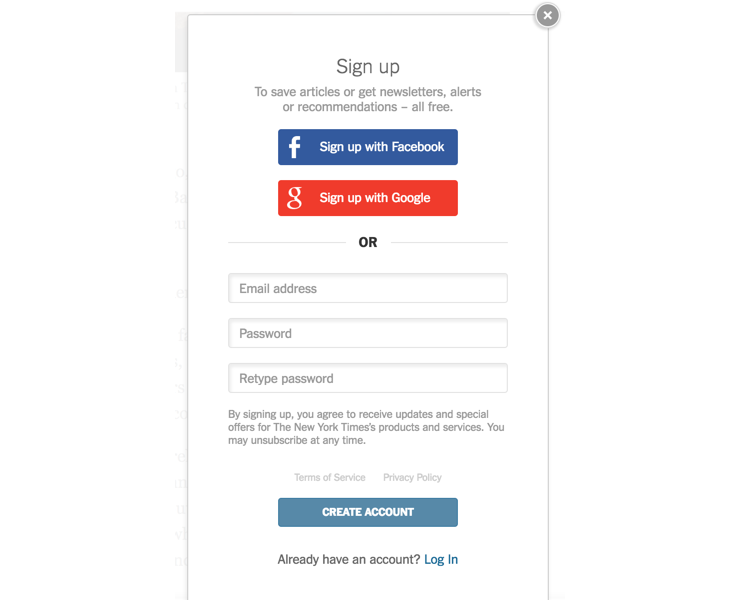 When you implement a CIAM social login, sign-up is quick with a 1-click registration. Once they log-in to your service, the social login gives you access to their social media data, which will help you personalize your marketing and content efforts in the future. You get permission-based access to the user's data including their interests, preferences, locations as well as accurate demographic data. These customer attributes are key in developing customized offers for upsell, informing content and new product decisions and developing customer relationships that drive future referrals. With a CIAM tool like Auth0, you can choose from over 30 social networks for your social login including Facebook, Twitter and PayPal. Digital marketing success relies on giving your customers a personalized experience, where the right message is delivered to the right person and the right time. A hybrid paywall approach mixes offers to reach a broader audience. The Wall Street Journal, known as one of the first to implement the strict hard paywall, has been experimenting with a 24-hour guest passes for non-subscribers who click on a story shared by a current subscriber or a WSJ writer. While the social strategy is sound to entice users based on articles they like, we should point out that the WSJ is not using a social sign-in, which is a huge missed opportunity. Especially when their traffic for this promotion is coming from a socially-driven effort. That said, leveraging social sharing in this way creates an organic way for people to join the WSJ based on an article that was shared within their social network with a topic that uniquely interests them. More than 50% of the Journal’s subscription sales now come from individual articles. 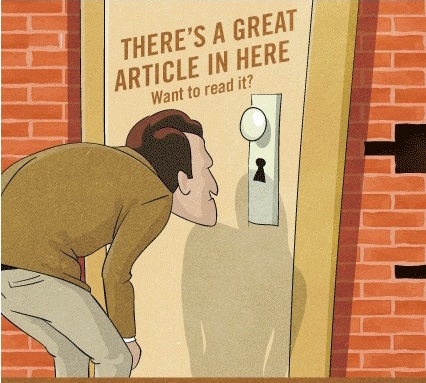 The hybrid paywall is a broad approach that opens the door for experimentation. If you approach your paywall as a conversion tool, the best strategy is always to test, measure and iterate until you find your sweet spot. If the WSJ used a social login, they would instantly gain a single view of their customer across all their marketing initiatives. Social profiles on sites like Facebook represent the true identity of a user, so once you connect with that social network via social login, you have the actual identity of your subscriber. You can then integrate this data with your CRM and marketing automation technologies to create highly-targeted marketing campaigns that deliver relevant and compelling offers to those customers. This type of personalized messaging ends with a custom paywall that delivers the right offer to the right user. Acquiring customers in the digital age hinges on giving your users an experience that is relevant and adds value to the individual. CIAM technology can give you the customer insights you need to execute this type of personalized marketing campaign. The media and publishing industry will experience a revenue renaissance, as long as they are able to attract and retain new subscribers. Paywalls will play an important role within the sales funnel as the point of conversion. Although there are different paywall methods, the end goal is to drive revenue. In each approach, CIAM has an important role in increasing conversions and generating new customer insights that lead to more relevant marketing. The next decade is up for grabs for the digital media industry, and the companies that embrace customer access and identity technologies will have a data-driven edge in attracting new customers with paywalls that entice rather than deter.